A statistical look at a slice of the domain name market. Most people agree that the investor aftermarket for domain names isn’t as lofty as it was a couple years ago. Just look at the mood and total sales at live domain auctions for proof. But gathering data to prove this is difficult. 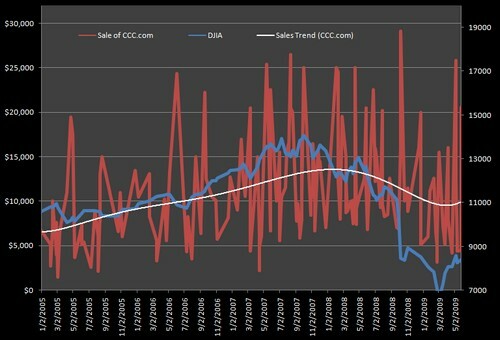 Richard Wixom of DNSalePrice recently took at stab at it, but with a different conclusion: the domain aftermarket is doing just fine, thank you. The drop in domain prices over the past year or two is small compared to the drop in the stock market. At least for three character domains. I’m not inclined to see this limited set of data as a proxy for the domain aftermarket overall, but it’s the best attempt I’ve seen to quantify the domain pricing trend using disclosed sales values. One difference between three character domains and the market at large is that three character domains are much more liquid. I cut Wixom’s data another way, adding in sales over $30,000 and calculating the median. The data show that median prices of three letter domains rose sharply from 2005 to 2007, held steady in 2008, and then dropped substantially in 2009 (with very limited data so far). The median sales price in 2005 was $6,700, 2006 was $10,175, and both 2007 and 2008 was $12,500. So far in 2009, with the disclosed data on DNSalePrice, the median three letter sale is $6,250. This doesn’t present enough data to suggest a 50% drop year over year, but you don’t need numbers to tell you that the investor resale price of three letter domains has fallen this year. I think it has bottomed out.